There is no doubt about it: Earth’s temperature is rising. Over the past 40 years, the earth has been warming at a rate of 0.15-0.2 degrees Celsius per decade, posing alarming consequences for our planet’s ecosystems. Although scientists debate the cause of this temperature change, there is a general consensus that humans are responsible for massive carbon dioxide (CO2) emissions that have contributed to global warming. Human activity — daily dependence on automobile commutes, running energy-engulfing factories, and living in houses heavily reliant on electricity — releases a substantial amount of CO2 into the atmosphere. In 2011 alone, the world emitted a total of 38.2 billion tons of the greenhouse gas. 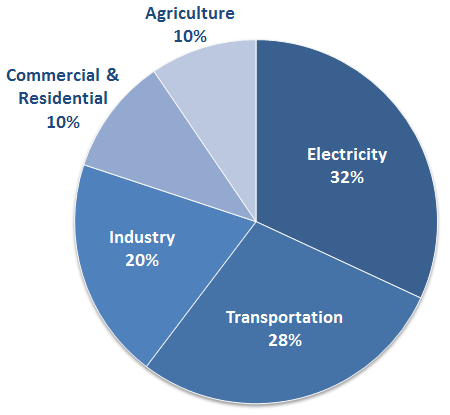 The majority of American CO2 emissions come from cars and household items. Recognizing that human activity is a primary cause in global warming is an important first step in correcting the problem. Image courtesy of the Environmental Protection Agency. Scientists believe that these emissions have caused a dramatic increase in the greenhouse effect, which has contributed to the gradual temperature increase on Earth’s surface. To an extent, the earth’s atmosphere does need greenhouse gases, including CO2, so that the planet remains warm enough to nurture life. Greenhouse gases act like one-way flow valves: They allow high-frequency energy from the sun into the atmosphere to warm our planet, but prevent some of the low-frequency energy reflected off the planet from leaving the atmosphere. However, excessive human CO2 emissions are compromising this efficient system. And the consequences are daunting. The National Aeronautics and Space Administration (NASA) warns of heat waves that compromise agriculture and fisheries, more frequent wildfires and insect outbreaks, and rising sea levels that reduce the availability of freshwater. These apocalyptic predictions fall in line with what is currently known about the climate and its effects on ecology. Now, researchers are searching for solutions to prevent the excess carbon released into the atmosphere from continually heating the planet. A new technology developed through collaboration between Harvard University and Lawrence Livermore National Laboratory could assist with this mission by enabling large-scale carbon sequestration — a process that involves capturing and storing CO2 so that it is taken out of the atmosphere. There are two common forms of carbon sequestration. One is terrestrial sequestration, which occurs naturally because plants take in CO2. The other is geologic sequestration, in which the greenhouse gas is captured from an industrial source through mechanical methods and is then placed inside a geologic formation. These formations include injection wells, which trap CO2 in porous rock formations, often sandstone or limestone. While geologic sequestration efforts have helped some, a better solution would be a method that can absorb excess carbon dioxide directly from the atmosphere. Carbon sequestration could be a vital tool in reversing global warming — but it must be efficient enough to remove emissions already harming the earth. MECS are promising because of their efficiency in absorbing CO2. 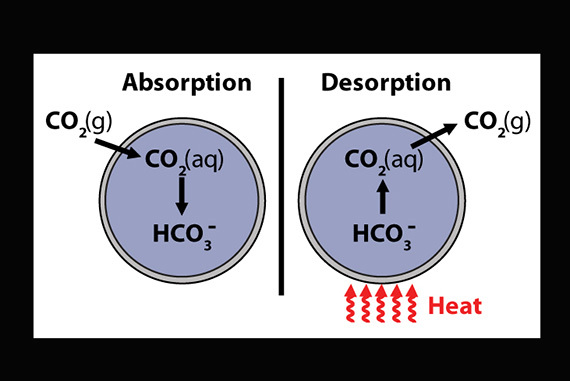 The permeability of microcapsules and the selectivity of sorbents can be modified to optimize CO2 absorption rates. To facilitate the absorption of CO2 through their capsule shells, MECS are engineered to have high surface areas and a refined ability for selective absorption of CO2 by the liquid sorbent. This encapsulated sorbent system absorbs CO2 at a rate of approximately 0.10 grams of CO2 per gram of solvent — more than five times the efficiency of a pool of liquid sorbent. When MECS absorb CO2, they force a reaction between the gas and the sodium carbonate inside of their capsules. This forms bicarbonate, a harmless product found in baking soda. The chemical reaction behind CO2 absorption via MECS is quite simple. The carbonate reacts with its water solvent to form bicarbonate and hydroxide ions. CO2 is then able to react with the hydroxide ions to form more bicarbonate, doubling the initial carbon content in CO2-saturated MECS. To further increase the rate of absorption, the scientists incorporated Cyclen into the capsule cores. This biomimetic chemical, which catalyzes CO2 absorption in aqueous solutions, increased the absorption rate of the MECS two to three fold. Heat can be used to release captured CO2 for safe storage. Image courtesy of Vericella, J. J. et al, Nature Communications. During testing, MECS proved both effective and efficient: Even after undergoing 10 absorption-desorption cycles, they retained 90 percent of their absorbing capacities. The MECS are returned to their original condition through a heating process, which releases the absorbed CO2 in a pure form. The MECS are heated at 90 degrees Celsius in humid air for 10 minutes. The CO2 released during this process is then captured and stored in injection wells, minimizing its potential to cause environmental harm. Thus, MECS have expanded the absorption potential of carbon sequestration methods, and researchers have figured out how to reroute the CO2 into injection wells for safe storage. This new MECS technology has multiple advantages over current CO2 absorption methods. Other techniques cause CO2 to react with open aqueous solutions, typically monoethanolamine (MEA). Although MEA can react with CO2 at a high rate, it is a highly corrosive and dangerous alternative. A known carcinogen, MEA not only requires large amounts of energy to remove CO2 from the atmosphere, but also yields toxic products in the process. MECS overcome these issues, as they are nontoxic, yield no dangerous byproducts, and require little heat to regenerate the sorbent. Improving best practice for carbon sequestration is an important step forward in the crusade against global warming. The collaboration between scientists at Harvard and at Lawrence Livermore has resulted in refined technology that could prove powerful in compensating for human-driven carbon emissions. Of course reducing the amount of CO2 that we release into the atmosphere is also important. Technology can aid in combatting the greenhouse effect, but we must also scrutinize the human behavior that propels the greenhouse effect further. One effective solution is a regulatory initiative enforced by the government. By demanding cleaner vehicles and using renewable fuels, the US government predicts a drop in American fuel emissions by more than 3,100 million metric tons by the year 2025. Greenhouse gas emissions can also be reduced by the use of alternative, carbon-free energy sources, such as solar power, wind power, and geothermal energy. While these technologies are sometimes used in daily life, further developments are necessary before they can be widely implemented. The current measures being taken around the world to reduce CO2 emissions are not enough. Annual CO2 release is still increasing dramatically, and the effects are beginning to feel palpable. An effective, efficient, low-cost method of carbon sequestration could help address the massive problem of global warming, and the development of MECS is a promising start. There is only one Earth to call home, and it must be preserved and respected. Cover Image: Art by Laurie Wang.